Sadly, I've reached the stage in life where I find myself to be blind at any distance. I need glasses to work, read, to be on the computer, to watch TV, and to drive. Thankfully There is any number of high quality and stylish solutions to my predicament. For the last few years, Persol has been my 'Go to' brand for all types of eyewear. Last year, having finally admitted defeat and concluded that for my own safety and that of the general public, it was high time to break down and get some corrective eyewear for driving. This, however, is complicated by the fact that my vision is as I have previously mentioned, is crap at every distance and I wanted to be able to use them in bright sunlight and at night as well (low light and darkness my eyesight has become alarmingly bad). I also wanted to be able to read my car's navigation system and to be able to read a bit if necessary. As luck would have it my optician had the perfect solution to my requirements - the 'Lifestyle' lenses (Aptly name since I guess my lifestyle is 'blind'). With these new lenses, I can see great at a distance while driving and also medium distance as well as easily read my navi and if necessary do some light reading (I have a separate pair of Spectacles for work and heavy reading). 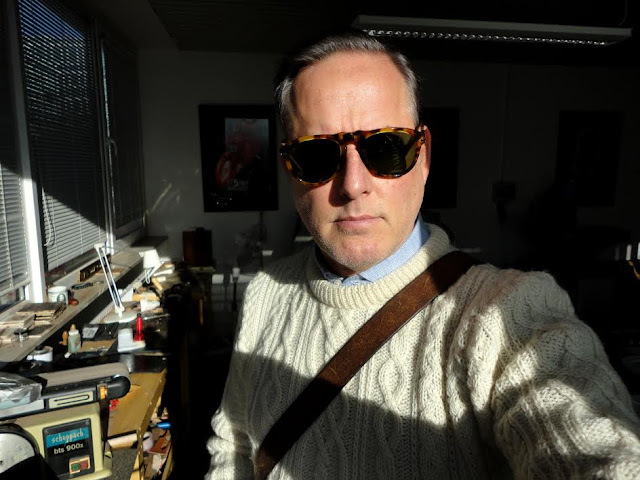 The frames I chose were the Persol 3007-V 1056, which is part of Persol's 'Vintage Celebration' collection. They've got a great traditional shape, which will match my overall wardrobe style and have a great mottled Brown/beige Tortoiseshell color, made from Acetate, which has (like all Persol glasses) been handcrafted in Italy. No surprise from Persol, the overall fit and finish are extremely fine. The hinges and hardware are perfectly finished and the color mix in acetate is wonderful. These frames are also quite light, which is important because of the extra weight of the clip-on's. My only other requirement had been the sunglasses issue. This was easily solved with the addition of a pair of Persol PO3007-c clip-on lenses in light gold metal, which are designed to fit my frames of choice. Benefit: they look really cool. These clip-on lenses are in blue, which is great for driving and seem to actually enhance my vision not just make everything dark (the sure sign of quality optics). Also, these lenses are NOT polarized because this would make reading the Navi screen or mobile phone very difficult. I've been very happy with these high-quality frames and clip-on lenses from Persol. They've become my constant stylish traveling companions.